Whether you are planning an international vacation, sending your kids to grad school abroad or immigrating on a millionaire visa, you need dollars to fund them. Think of them as future dollar liabilities. As an investor in India, the biggest problem is that Rupee returns may not be enough to purse your Dollar dreams. 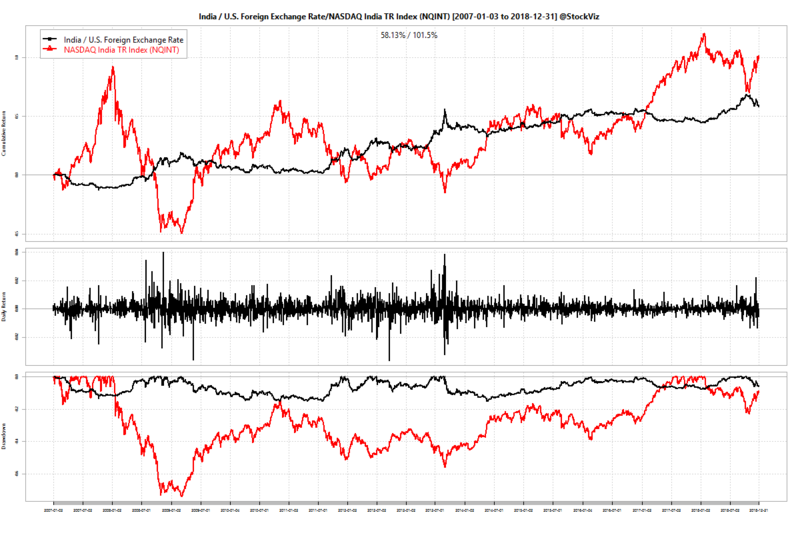 Here is a chart of USDINR (in black) and NASDAQ India TR Index (NQINT, in red.) The NQINT index is a broad-based Indian equity dollar index. Between 2007-01-03 and 2018-12-31, the rupee has depreciated by an annualized rate of 3.89%. And measured in dollars, Indian equities have returned an annualized 6.02%. 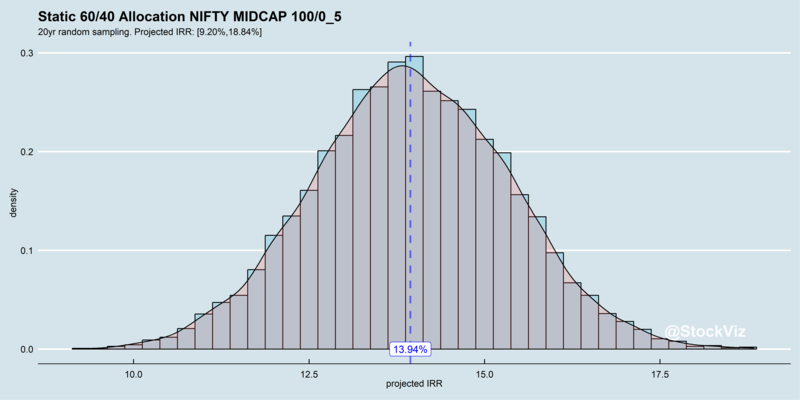 VO is slightly ahead with an annualized 7.06% return vs. Magnum’s 6.12%. 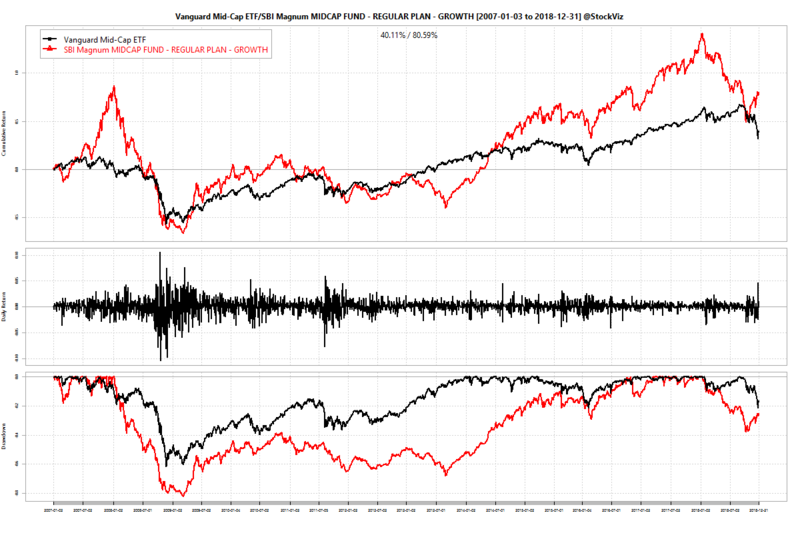 However, note the steep drawdowns of Magnum vs. VO. Buy Fund-of-Funds (FoFs) that invest in US equity. Open a US brokerage account and buy a target-date fund directly. The problem with buying an FoF is that the acronym also stands for “Fees-over-Fees,” given how you pay both for the wrapper and the biscuit inside. For example, the Franklin India Feeder – Franklin U.S. Opportunities Fund has an expense ratio of 1.74% (0.92%, if direct) to buy a mutual fund (Franklin U.S. Opportunities Fund I(acc)USD) that charges another 0.85% on top (FTI, MS.) Whereas, IUSG, an ETF that tracks its benchmark (Russell 3000 Growth,) has an expense ratio of only 0.04%. To make matters worse, the mutual fund has under-performed its benchmark (see). Most investors are not aware of option #2. Opening a brokerage account in the US is pretty straightforward. TD Ameritrade does a pretty decent job of onboarding new accounts. But the problem is in transferring funds. While Indian brokerage accounts can be funded through a mouse click, transferring funds abroad requires some paper-and-leg-work. You need to fill out a bunch of forms and take it to your bank. But the process is worth it given the cost savings throughout the life of the investment and the breadth of choices available through this channel. 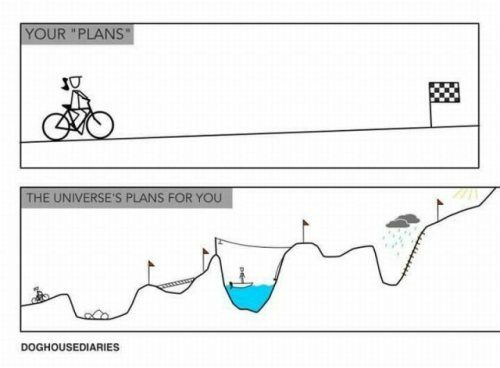 Most investors save with a specific goal in mind. Say, your kid is 5 years old and you want to fund his grad school abroad – a good 20 years away. The easiest and cheapest way to go about this is through Vanguard’s target date funds. Each Target Retirement Trust invests in several low-cost Vanguard index funds to create a broadly diversified mix of stocks and bonds. 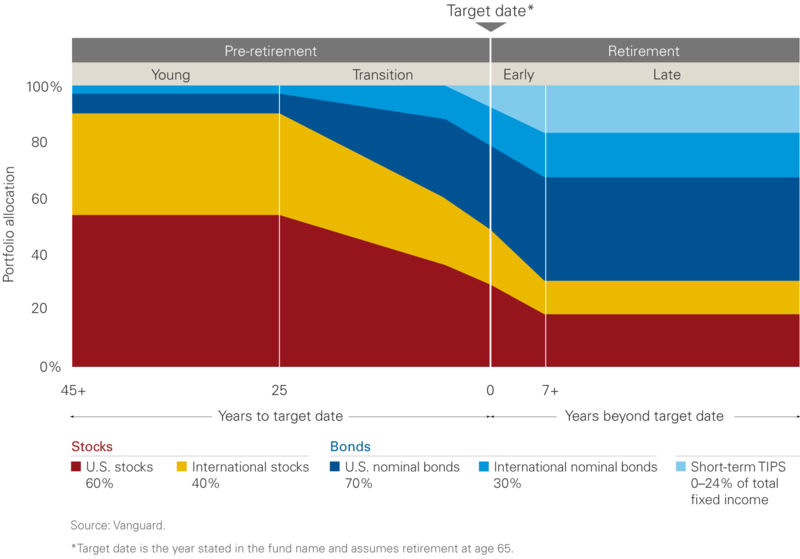 The year in a Target Retirement Trust’s name is its target date, the approximate year in which an investor in the trust expects to retire and leave the workforce. A Target Retirement Trust will hold more stocks the further it is from its target date, seeking stocks’ higher potential growth. To reduce risk as the target date approaches, Vanguard’s investment managers will gradually decrease the trust’s stock holdings and increase its bond holdings. Given that we are in 2019, you can just buy the Vanguard Target Retirement 2035 Trust and average into to it for the next 20 years to fund your kid’s education abroad. Your dreams grow along with your income, if not faster. If those dreams involve international travel or studies, it makes sense to bite the bullet today and start saving for your dollar dreams in dollars. It is cheaper, over the long run, to do so through a US brokerage account. Disclaimer: This blog post is for informational purposes alone. Do not treat this as investment advice. 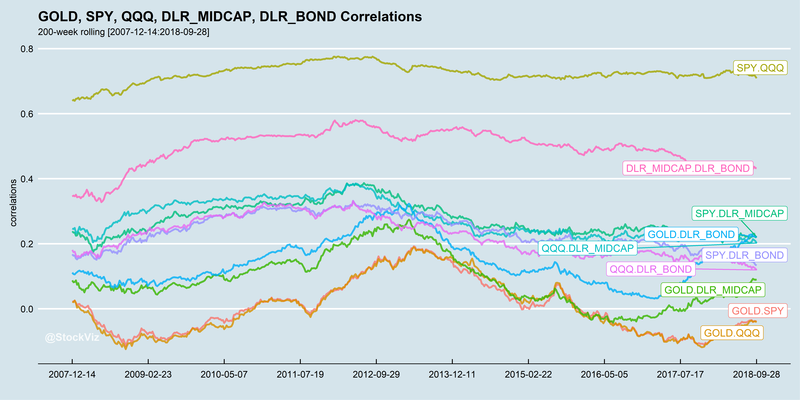 How does an equity/bond 2-asset portfolio look like? Indian midcaps + bonds with Nasdaq-100 ETF. 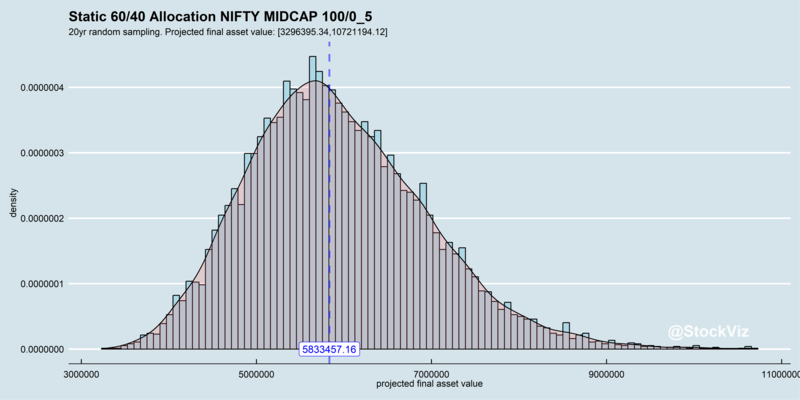 Is there a benefit to using portfolio optimization algorithms after taxes and transaction costs are taken into account? 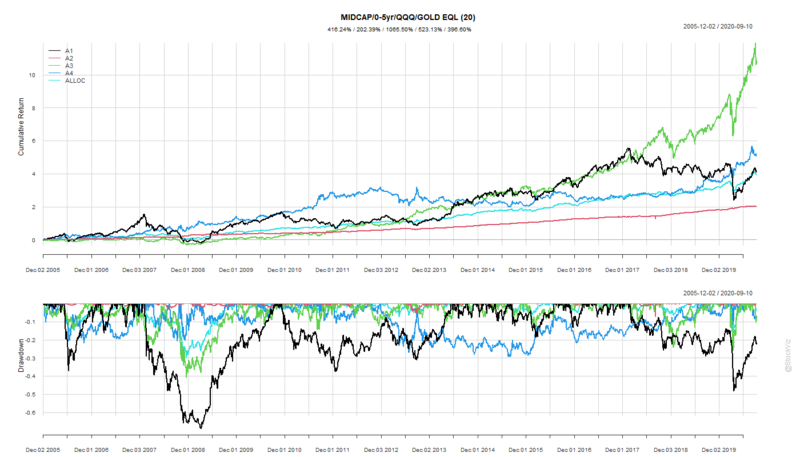 Does gold have a role to play in a systematic, diversified portfolio? A ready-to-invest Theme, the EQUAL-III, that takes care of keeping track of everything. What are the range of expected SIP returns under prudent asset allocation schemes? Our recent series on asset allocation walked through how different investment decisions affect portfolio returns and risk. Number of assets: Three is better than two and four. Rebalance threshold: Allowing a single asset to drift upto 80% reduces transaction costs and taxes. 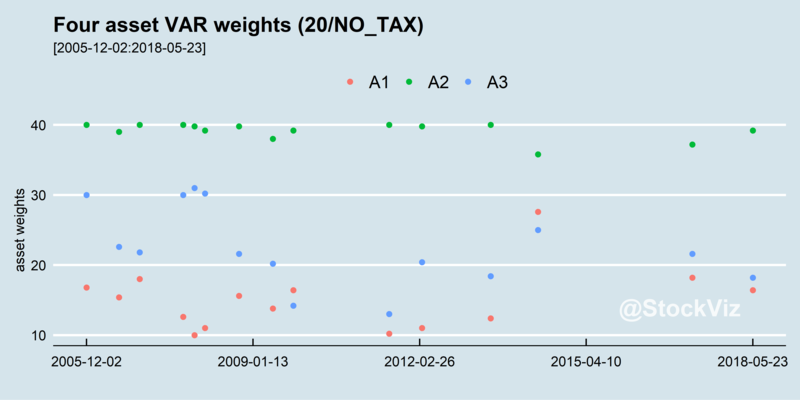 Weighing scheme: Equal weight is better than portfolio optimization methods. 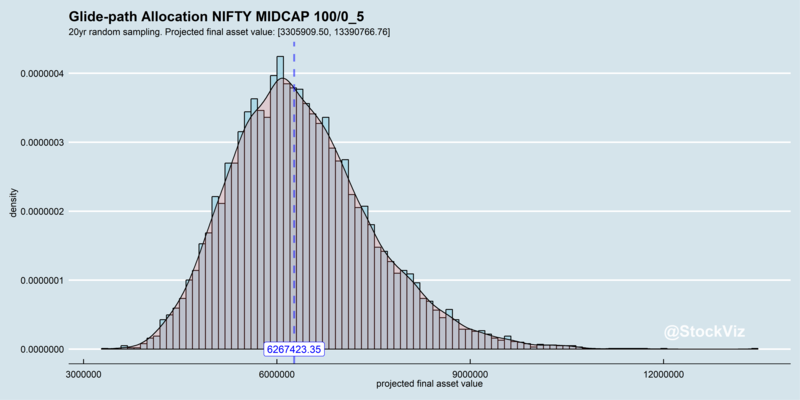 Our previous posts showed how various allocation decisions impact optimized and equal-weighted three-asset portfolios. 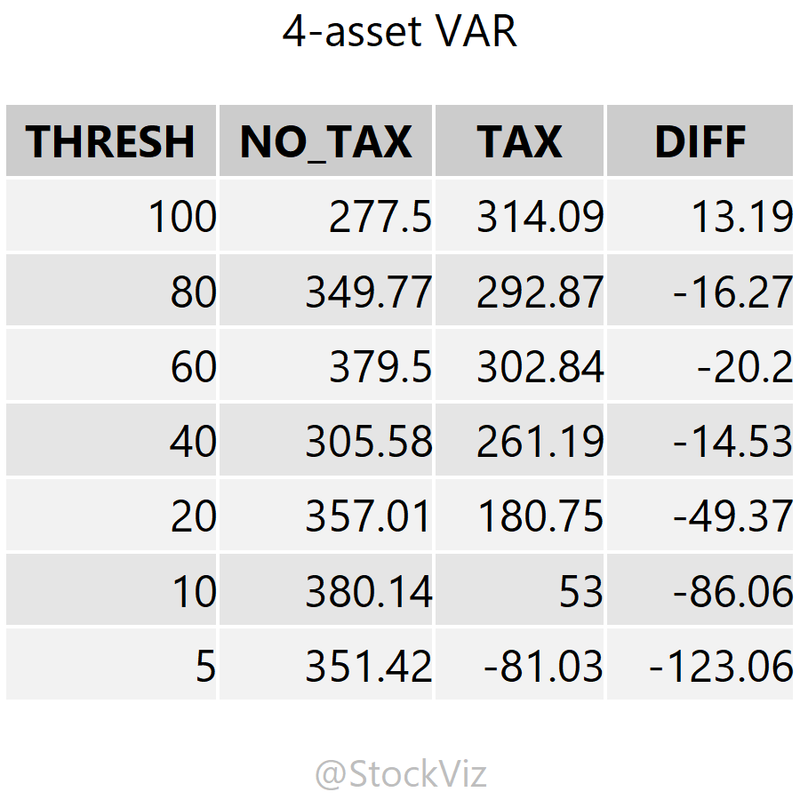 Here, we add a fourth asset – gold – and run it through the same scenarios. 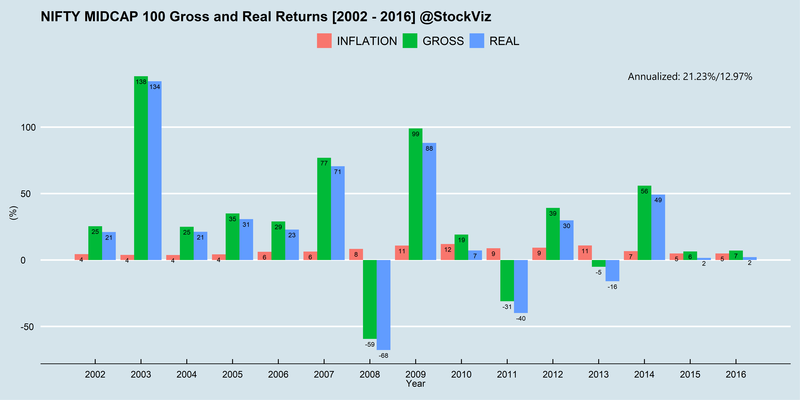 In the cumulative return and drawdown chart below, A1 is the MIDCAP index, A2 is the 0-5yr bond index, A3 is the QQQ and A4 is gold. A tax drag of 10% and an STT of 0.1% is applied at every rebalance. The rebalance threshold is set at 20%. 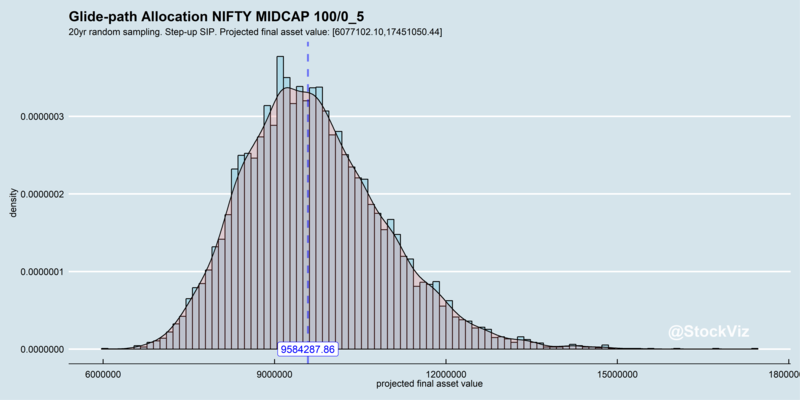 The light-blue lines are the resulting portfolio returns. 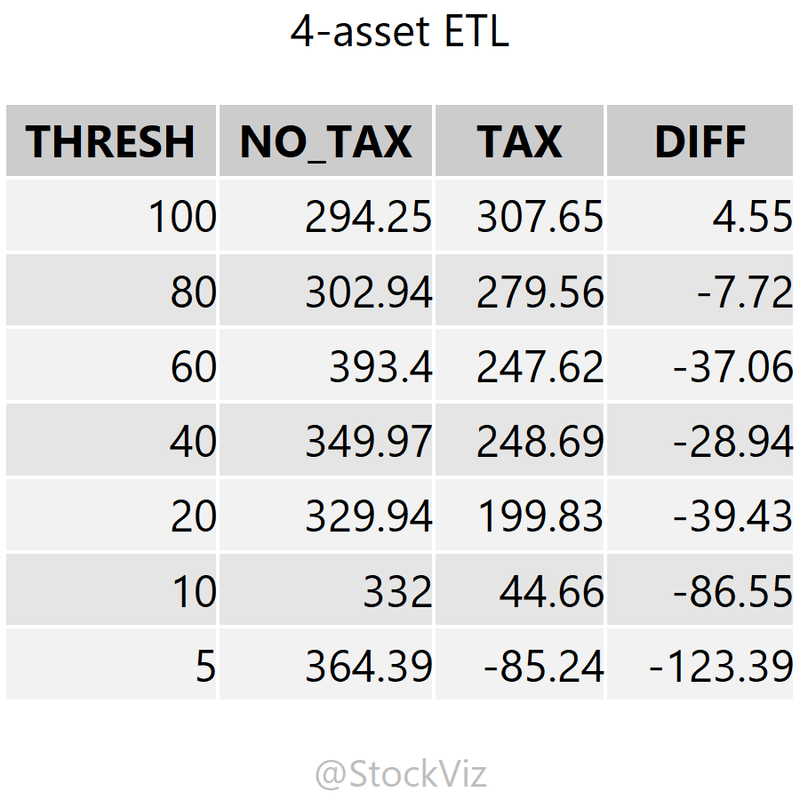 In the case of optimized portfolios, assets are allowed to have a weighting between 10% and 40% during the optimization process. Every time there is a rebalance, the tax-man cometh and taketh away. Trying to minimize taxes is equivalent to minimizing the number of rebalancing events. To minimize reblancing events, one could set the threshold of rebalance higher. But there is a point of inflection with regards to after-tax returns. Allowing a single asset to balloon in weight risks larger portfolio drawdowns if that asset deflates. 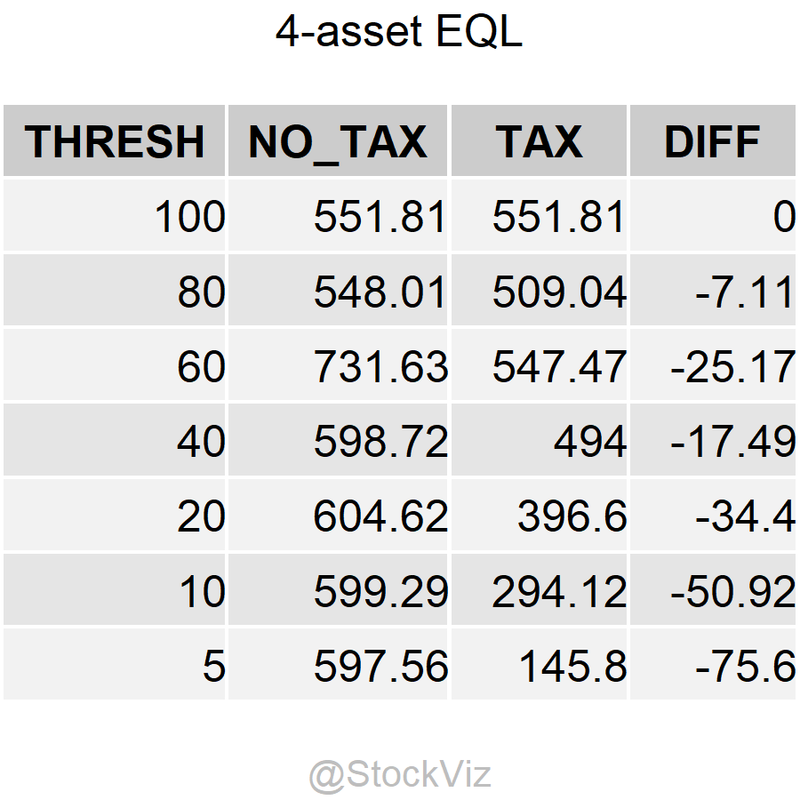 A four-asset equal weight portfolio under-performs a 3-asset equal weight portfolio. 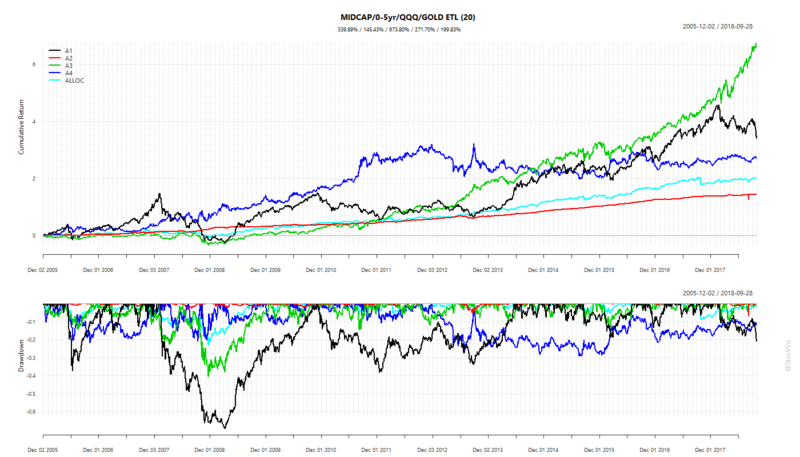 Gold maybe a good diversifier, but it doesn’t appear to do any favors to the portfolio on the performance front. Adding gold to a portfolio does not look like a good idea when looked through the lens of asset allocation schemes discussed here. However, there is a strong case for owning gold and the Sovereign Gold Bond (SGB) Scheme makes a lot of sense. See our previous post regarding the case for owning gold in India here. Code, charts and the complete result dataset are available on github.